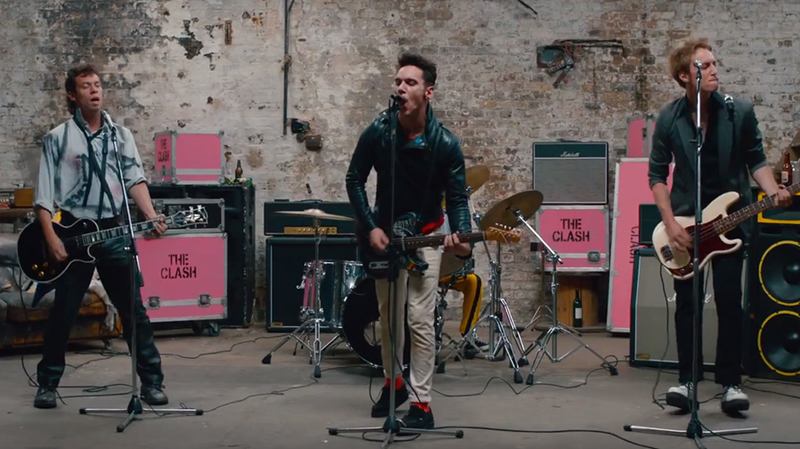 When I first saw the trailer, I thought that you’d have to love The Clash to love London Town, that it would be a sort of tribute movie that I couldn’t appreciate since I don’t appreciate the band. But by the end of the film, I realized that wasn’t the case at all. Instead of being a music movie, it was a Hallmark original, a British version of the cheeseballs we’re served far too often over here in the States. I didn’t know that other countries produced such low-impact features that only a mother could love, films that you have to adore like a long-lost puppy in order to enjoy. London Town wasn’t at all what I was expecting, but I did fall for the trick of rooting for the underdog, so I guess it wasn’t a complete loss. Disco is dead, rock’n’roll is taking the throne, long live the Queen. This is London in the late 70s, as one decade gives way to another, as music displays the direction the new culture is taking, or perhaps even guides it along the way. 14-year-old Shay Baker lives with his dad and sister in a small town outside the capitol, taking care of the family after his mother left to join an alternative commune in the city. His dad sells pianos and drives a cab at night, trying to keep enough money coming in to hold off the debt-collectors, while Shay takes care of his sis, goes to school, and helps around the store. He is classically trained, loves music, and has his eyes opened to punk when his mom sends him a cassette of a new band, the only one that matters; The Clash. That sound changes Shay’s life, and opens the door to new possibilities beyond the future his dad has imagined for him. On the way into London one day, Shay meets Vivian, a punk girl around his own age who seems cool beyond her years and invites him to a Clash show. This is the beginning of a grand adventure, one that will teach Shay about life and show him both the beauty and danger therein. His father gets injured on the job, his mother is hopelessly irresponsible, his sister is relying on him, Vivian is like a goddess, and then he meets Joe Strummer; that’s a lot to handle for one kid coming-of-age in a city that’s attempting to do the same, and not every decision he makes will be the most brilliant. I compared this film to a Hallmark movie, and it really was shocking to me to come to the realization that England must have its own cheesy film genre, that there must be an equivalent across the pond. It’s not that London Town is bad, it’s that it’s sappy and simple, a movie made to tell a pleasant story without bothering with the messier details. That’s a category that some people like, a category that doesn’t challenge them in the way that other films do, and something that wraps up at the end with a nice bow, despite the difficulties of real life. Fine, if that’s your thing, and even I can become invested in that sort of flick if I fall in love with a character or two, or if I can just ignore the cheese long enough to appreciate what some under-talented director is trying to tell me. 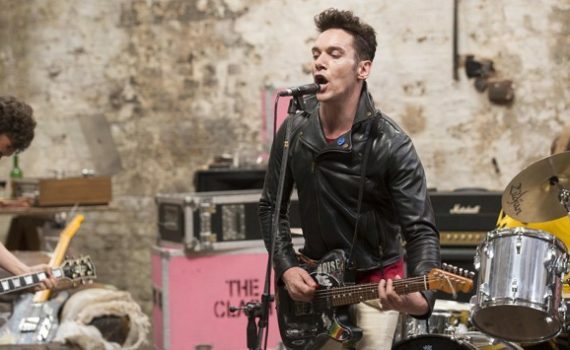 The music helps, Clash songs and Rhys Meyers with a cool Strummer portrayal, providing a backing track to a story that’s a little silly if you look too closely. And the axle is Huttlestone, who didn’t bomb, didn’t shine, falling somewhere in the muddy middle. He’s a kid with talent, that can’t be denied, this role might just not have been perfect for him and/or written very well. Gavroche in Les Mis, Jack in Into the Woods; he can sing, he can act, I’m just not sure he’s quite ready to put a mediocre movie on his thin shoulders. London Town is exactly that; middling and mussy and not super-strong, a feel-good film rather than an award-winner. It is lovable in an awkward way, just like its star, so give it credit for trying, only don’t expect too much. Video – With an aspect ratio of 1.85:1 Anamorphic Widescreen, the video quality of the disc isn’t great, but it’s not so bad that it will distract you from the story. Again, like a Hallmark movie, the visuals aren’t exactly the point, and so the clarity of the picture isn’t either. The color is fine, the costumes are pretty rad, and there’s nothing pointedly terrible, so give the video the same forgiveness you give the plot. Audio – The film was done in Dolby Digital English 5.1, with choices of English SDH or Spanish subtitles. That’s it as far as audio options go, and the quality of the sound is about as basic as the video. The soundtrack is pretty cool though, with Clash songs and a punk feel that really transports you to the era. Extras – The only special features on the DVD are an interview with Jonathan Rhys Meyers and a trailer for the movie. Recommended. Go in with a relaxed mindset and knowing that the film has good intentions; that’s the only way to enjoy London Town. I’m not sure how Clash fans would feel, maybe they’d like the Strummer representation, maybe they’d hate it, who knows. But you get a little music, a little political blowback, and a little history, so it’s not all a lost cause. Just don’t expect too much from this movie, it isn’t wonderful in any way, it’s more a sappy attempt to tell a growing-up tale amidst the backdrop of some actual goings on. The video is forgettable, the audio the same, and there aren’t many special features on the disc, so look elsewhere for technical fireworks. But watch with semi-confidence that you’ll root for the kid to find happiness, and when he does, you won’t begrudge him a ‘meh’ movie.